SpyOFF is a simple VPN service that takes pride in the high speeds it offers, claiming to be the fastest VPN available. It has not been on the market for very long, but it has quickly won over a rather large number of users, so we decided to take it for a test drive and report our findings and impressions in this comprehensive SpyOFF review. The design of SpyOFF’s VPN client did not blow us away, but it is still rather elegant, with clean lines and a nice color scheme dominated by red, black, gray, and white. What is important is that the client is extremely intuitive and allows for great ease of use. The most frequently used buttons are large enough and clearly visible and the settings are readily available and easy to understand. This makes SpyOFF suitable for all user profiles, not only those users who are familiar with VPN technology. The service currently operates 395 servers in 21 world countries. While not low enough to diminish user experience, the number of server locations could be greater and we hope that SpyOFF will follow the lead of the most powerful VPNs and expand its scope to include other locations, particularly in Africa where it has none. As we mentioned previously in this SpyOFF review, the service is advertised as the fastest VPN in the world, so we could not wait to see it in action. We were more than pleased with the results of our tests, as the speeds were consistently good, mostly staying slightly above average. Of course, the speeds you experience depend on the proximity of the server you connect to and the encryption protocol you choose, but regardless of your choice, you are sure to enjoy glitch-free streaming and fast uploads and downloads. The performance was excellent throughout the tests, allowing us to give SpyOFF a high score in this department. We are also happy to report that we detected no DNS or IPv6 leaks, which further confirmed that SpyOFF is a VPN service you can rely on. SpyOFF is compatible with the most popular operating systems, including Windows, Mac OS X, Android, and iOS. It also provides setup guides for Linux and routers. 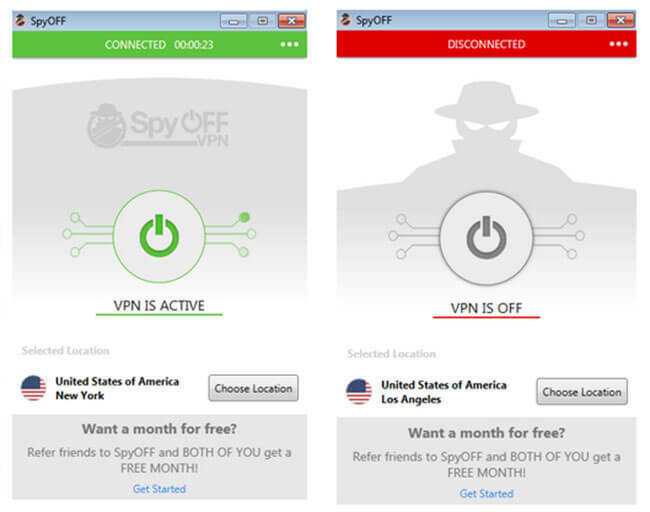 While not impressive, SpyOFF’s compatibility should satisfy the needs of the majority of VPN users. The great news is that you can protect all of your devices with a single account. You can configure it on an unlimited number of devices, with the possibility of simultaneous use. SpyOFF does not seek to impress with an abundance of advanced features but instead focuses its efforts on the most important aspects of the service – speed, privacy, and safety. No limit on the number of concurrent connections is a nice touch that is sure to be appreciated by users who like to keep all of their devices safe. Speaking of no limits, SpyOFF allows you to enjoy unlimited bandwidth and data transfers, limitless speed, and unlimited server switching. The provider says nothing about P2P sharing specifically, but based on our experience during the tests, silence implies consent. Therefore, we can say that torrenting is an option with SpyOFF, although this is not expressly stated. SpyOFF VPN client comes equipped with a couple of handy features. For example, you can configure it to autostart with Windows and decide what you want it to do when the connection gets lost: reconnect automatically, activate kill switch or do nothing. 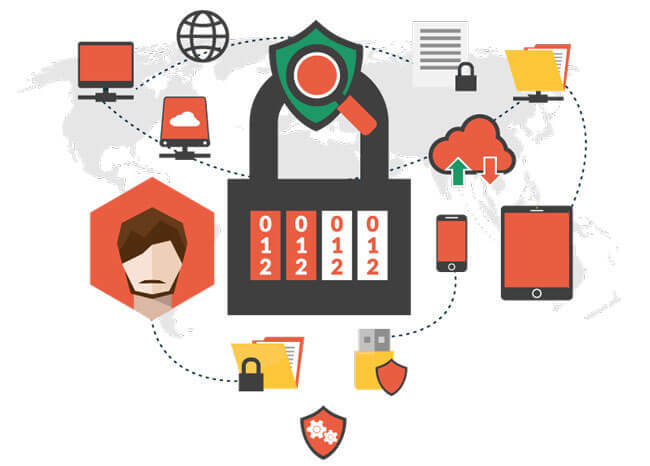 SpyOFF uses 3 encryption protocols, including PPTP, L2TP, and OpenVPN. To help you choose the protocol that best suits your needs, it brings you 4 security modes. The Ultra Secure mode is for users who want maximum safety. In this mode, the preferred protocol is OpenVPN with 128-bit and 256-bit encryption, which is the safest and most reliable protocol currently available. In the Balanced mode, L2TP with 128-bit encryption is the recommended protocol, as it tends to achieve an optimal balance between speed and safety. In the Highspeed mode, SpyOFF offers PPTP protocol, which brings a lower level of safety than the other two protocols but does allow you to enjoy above average speeds. In the Expert mode, you get to configure your VPN protocol and choose from all three available options, depending on your current needs. SpyOFF protects your privacy with a strict no-logging policy. It does not monitor or keep records of your online activity and does not keep any connection logs, which is excellent news for all users who want to stay completely anonymous. While it does store your account information, this data is protected with strong 256-bit SLL encryption. Customer support is not the finest aspect of this service, to say the least. Its knowledge base is not as extensive as we would like it to be and the absence of a search option makes it harder to find what you need. The FAQ section contains only a couple of general questions with mostly one-sentence answers and the troubleshooter is not particularly helpful, with less than a dozen randomly selected topics. If you want to learn more about the company by reading its blog, you need to learn German first. Keeping all of this in mind, one would expect that the service would at least offer support via live chat, so users could quickly receive answers they cannot get by browsing the knowledge base, FAQ, and troubleshooter. However, to our disappointment, this option is not available. While doing research for our SpyOFF review, we discovered that the only way to get in touch with the support staff is via email. Luckily, this method works well, with short wait times and pretty adequate responses. SpyOFF offers 2 subscription plans that exclusively differ in the duration of the subscription. The Starter plan, which brings you one month of protection, is billed monthly and costs €9.99 per month, amounting to around $11.97, depending on the exchange rates. The Premium plan is the annual plan. It is billed every 12 months and costs €6.99 per month, which is around $8.38. The subscriptions are not the most affordable around, but they are pretty average and justified by the quality of the service. 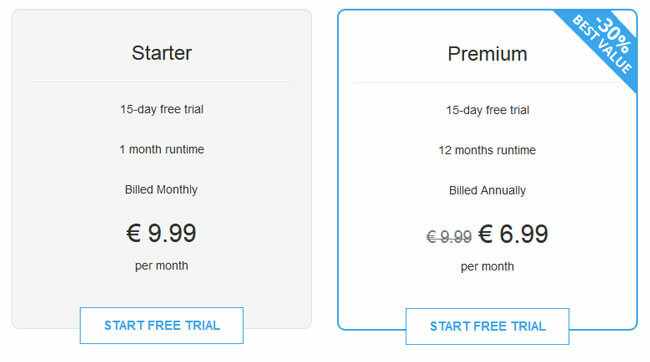 Both plans come with a 15-day free trial, which should be more than enough to test the VPN and determine whether purchasing a subscription would be a good choice. Payment options are limited to credit card only. We sincerely hope that this will change and that the company will start accepting Bitcoin in the near future. Finishing off this SpyOFF review, here’s a quick overview of the features that wowed us and the aspects of the service that could use some improvement. Our ratings are the result of an objective and independent evaluation of SpyOFF, generating the final rating that reflects the overall quality of the company. Ratings may change as the service changes. SpyOFF user rating based on 6 user reviews. Too expensive considering that it does not offer much, apart from good speed and no logs. Works perfectly, easy to use, the speed is excellent as promised. We found 0 verified SpyOFF discounts for April, 2019. Discover the full range of possibilities SpyOFF offers and become an advanced user in no time with our beginner-friendly SpyOFF guides. Whether you are interested in secure torrenting, unblocking Netflix, setting up SpyOFF on all your devices or you simply want to learn more about SpyOFF, you can find verified information and clear instructions in our SpyOFF guides below. Is SpyOFF Safe? 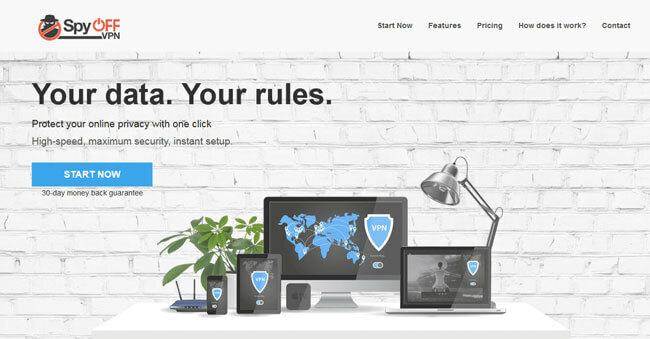 - which contains a full overview of this VPN service’s security suite.